Inherent vice: noun Hidden defect (or the very nature) of a good or property which of itself is the cause of (or contributes to) its deterioration, damage, or wastage. Based on the novel by Thomas Pynchon, the 2014 Academy award-nominated movie Inherent Vice is available now on Blu-ray, DVD and Digital HD. Starring a long list of veteran actors, it looks appealing enough to want to give it a shot. However, if you haven't heard of it, don't worry, you aren't missing much. Based in 1970's California, the film follows private eye Doc Sportella (Joaquin Phoenix; Walk The Line) as he investigates the disappearances of his ex-lover, Shasta Fay (Katherine Waterston; Michael Clayton) and her billionaire real estate mogul, married boyfriend, Michael Wolfmann (Eric Roberts, Paranormal Movie). As he delves deeper, an eclectic cast of characters, including Josh Brolin (True Grit) as LAPD detective "Bigfoot" who is bent on revenge, and Owen Wilson (Midnight in Paris) as Coy Harlingen, a former druggie working every angle, emerge to connect several stories together in an odd plot. The acting is excellent from most of the cast, especially Phoenix, who is strung out 98% of the time, and Brolin, the uptight cop barely holding it all together. Reese Witherspoon (The Good Lie) as straight laced, Deputy D.A., Penny Kimball is terrific as always. Maya Rudolph (Bridesmaids) and Martin Short (Saturday Night Live) take on equally creepy (but for different reasons) smaller parts, which are a departure from their usual "funny man" fair. What isn't funny is the movie itself. It is weird, hard to follow, makes no sense, and is boring half the time. There were many moments I wanted to just turn it off but at the last second I would get sucked back in. I kept thinking there would be a payoff at the end; that all of the subplots will be tied together nicely and the movie would finally make sense, but that never happened. By the time the credits rolled, I had to ask myself if this wasn't just the ramblings of some drug laden hippie. I think it was trying to be some sort of Meta, thought provoking, artsy, symbolic look into drugs in the late sixties and seventies but it missed by a mile. It wasn't interesting, coherent, cohesive or entertaining in anyway. The 1080p video and DTS-HD Master Audio 5.1 is what you would expect. The movie is set in dark tones most of the time, perhaps to mimic a drug infused haze, but none the less, the picture is sharp. The Blu-ray extras are, much like the movie itself, confusing and disappointing. There were 11 minutes worth of what can only be described as extended trailers and did nothing to help explain the plot or purpose of the film. 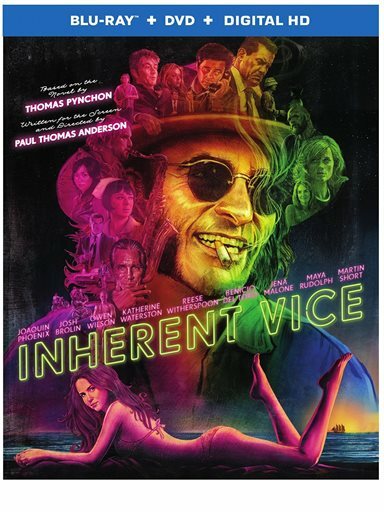 Download Inherent Vice from the iTunes Store in Digial HD. For more information about Inherent Vice visit the FlickDirect Movie Database.